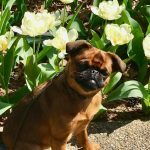 B-Naturals.Com Newsletter » Blog Archive » Want to improve Your Dog’s Diet? Here is the SOLUTION! Need to Put Together a Special Diet for Your Dog’s Specific Health Issue? Want to Start Feeding a Raw or Home Cooked Diet but don’t know where to start? For a limited time only, Lew Olson will provide you with a free 30-minute consult with the purchase of either her Cooked Diets or Raw Food Diets videos. The consult (a $60 value) can be used to help you improve your dog’s diet, help you get started and feel confident about feeding a raw or home cooked diet, or to help you put together a special diet to address your dog’s specific health issue. The consult includes recipes that offer variety and recommendations for any supplements that may be needed. The consult can be by email, phone or messaging and includes 6 brief (10 minutes or less) follow-up support consults. This offer expires soon, so sign up today to take advantage of this personalized support by clicking on the following link and selecting either Raw Diet or Home Cooked Diet Video. Important Note: Once you have signed up, email Lew Olson, at lewolson@earthlinet. She is looking forward to helping you feed your dog the best diet you can and supporting your dog’s health! But act fast, because this offer is only good through July 6, 2019! Lew Olson began feeding a raw die to her dogs in 1994. She has fed large dogs (Rottweilers) and toy breeds (Brussels Griffon and Toy Manchester). She was a research assistant in Graduate School and has her PhD in Natural Nutrition. She has designed diets for purine stones, calcium oxalate stones, kidney disease, liver problems, cancer, heart issues, epilepsy, diabetes, pancreatitis, IBD and issues with poor or ‘sensitive’ digestion. She is currently active in training her own dogs in performance events (rally and obedience), she is an AKC Judge and she constantly researches canine nutrition and health issues. 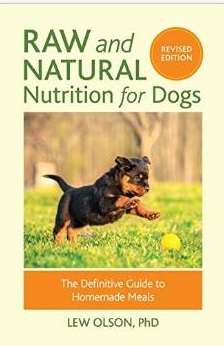 She is the author of “Raw and Natural Nutrition for Dogs”, and has owned “K9Nutrition” since 1998. K9Nutrition first appeared on yahoo groups, and is currently active on Facebook with over 13,000 members. 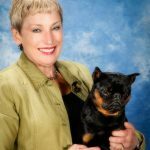 She is all about the health of your dog and looks forward to helping you and your dog with any nutrition problems and questions you may have. Remember, this offer expires July 6, 2019, so don’t miss out on this wonderful opportunity to get the support and gain the confidence you need to feed your dog the best possible diet you can! Click here and sign up now! And don’t forget, Omega 3 fatty acids are the best way to support your dog’s skin, immune system and it protects the heart, liver and kidneys. 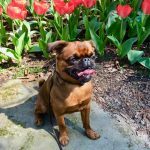 Confused about which Omega 3 oil is the best for your dog and how to much use? Find out more by clicking on the link below.